All All Card / Paper Envelopes Craft / Card Blanks Packaging Samples etc. These bags are made in the UK from cellophane film that has been accredited biodegradable & compostable to 'BS EN 13432' and 'OK Compost'. They are also approved for Anaerobic digestion (ISO 15985) & Marine biodegradation ASTM D6691-09. The film has also been tested to ensure that once composted there are no adverse effects on the plant growth. Measuring approximately 305 x 120 x 60mm, these cellulose gusset bag will hold approx. 1.3kg of rice. Storage: Keep dry and below 30ºC (ideally between 17-23ºC) and away from local heat source or direct sunlight. Dimensions are approximate, +/- 5mm. Derived from renewable wood pulp. 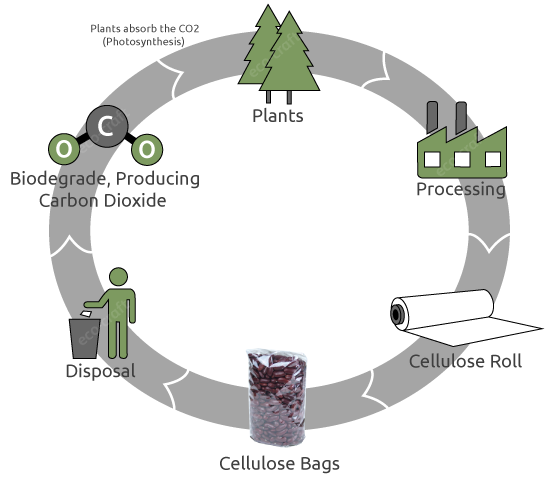 Cellulose is a substance from a plants cell wall, this can be extracted from waste plant material to produce the bio film used in these bags. Once used, these bags will biodegrade producing CO2 and H2O, these 2 compounds are combined with sunlight and converted into energy by plants in a process called photosynthesis. The resulting tree growth can then be used to produce more bags. This product is made from recycled paper. This product is made from material that can be recycled. This product is biodegradable at end of life. This product is compostable at end of life. rubber-stamps, screen printing and letterpress etc. Glue is required in the assembly of this product. No glue is required in the assembly of this product. Made in Britain for eco-craft by selected suppliers. © 2014 Eco Craft. All Rights Reserved.